These free plus size patterns include patterns in plus sizes, make your own patterns, and tips for adapting patterns. As a plus-sized gal myself, I know how hard it can be to find clothing in that size. Not only do stores limit the size, but often, there are not very many free sewing patterns out there for women our size either. Another problem we often encounter is plus sized clothing that does not fit right it at all. Some pants are made for women that are much curvier than ourselves or a top might be cute, but it's way too short. I have a long torso, and I seem to have the hardest time finding shirts that aren't crop-tops on me! I think knowing how to sew is essential for everyone, but for those of us into the plus sizes, it is definitely a must. Not only will you be able to create your own clothing, but you will be able to make other items out there a more custom fit. 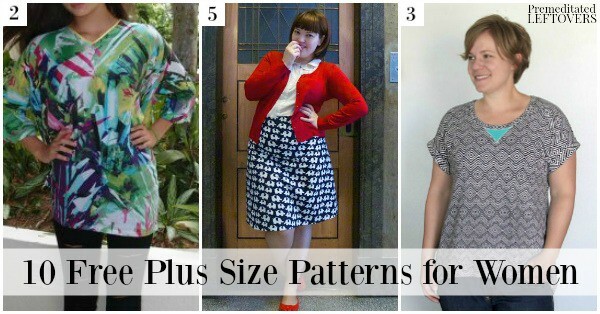 Here are 10 free plus size patterns to get you started. Please note, I included some patterns that I think would be easy to upsize and look flattering on plus sized gals as well. Here is some information on how to make a regular pattern fit plus sized from Melly Sews. This Free Pattern and Dress Tutorial from The Littlest Studio is the perfect, versatile black dress. The bodice comes in 9 sizes up to 22 and the skirt template is based on your waist measurement. If you are new to sewing, this Easy Tunic from So Sew Easy would be a great project to try. It is easy to make but the end product looks amazing and would pair well with jeans or leggings (or made one size up as a swim cover). This Easy Tee with Capped Sleeves from It's Always Autumn is a great simple top to create in any pattern. This Calculator to design your own Yoga Skirt from The Sewing Geek is great for any size! You just put in your measurements and it helps you come up with your own pattern. Frocks and Frou Frou shows you how to make a cute A-Line Skirt in a quick amount of time. This tutorial is so easy you could make several. It's Always Autumn has another great pattern using her Easy Tee pattern, and it's this Gathered Waist Top. I think this would be very flattering. This Scallop Top from On the Cutting Room Floor has a lovely scalloped neckline and a flattering shape. The free pattern comes in sizes 4 – 22. These Casual Pants from On the Cutting Room Floor go up to size 22. They are super cute for a dressy occasion or just around the office! This Cabana Dress from I Heart Jenny's Art can be made in any size because the pattern asks you to take your own measurements. This is a perfect maxi sundress! Sew Caroline's Tank Dress Tutorial is easily adapted to any size. You just use a tank you already have (or a new one) in your size and build the dress around that and your own measurements. Elaine I am in the boat with you. I finally found a shirt that looks decent on me and I plan to take it apart to make a pattern of it. Finding fabric that isn’t too thin or goofy or overly expensive is another matter.